Back in October 2007, we decided to enhance the little patch of field that we had bought for a wildlife area by adding a pond. This is a post about what happened, and the extraordinary amount of wildlife a small pond can attract. Of course, before you see any of the wonderful species that may or may not visit, there is the unremitting slog actually digging the thing! I was assisted by my mate, Dave, for a weekend, and we soon had a very satisfactory hole. We tapered the ends of the pond to make sure that any hedgehogs or other small mammals that might fall in could get out easily. Then, of course, it had to be made watertight. This was no problem where I used to live in Cambridgeshire, where if you dug down you were soon carving your way through the densest clay, but here in Suffolk, just on the edge of the Brecks, the soil is light and sandy, so I opted for a butyl rubber liner, protected by woven geotextile underneath (so no sharp flints or stones would puncture the liner) and I laid the same textile on top so that any sand and soil put into the pond could not puncture the liner from above if I was wading in it. Which brings me to a useful tip - when you anchor the membrane in a surrounding trench, don't run the top textile into it as well. For three anxious days I thought the pond was leaking. What was really happening was that the textile above the water line was acting as a wick. Water crept up it by capillary action and either evaporated or was absorbed by the surrounding soil. In any event it lost 180 gallons in two days! Suddenly I realised what was going on (O level in physics not wasted) and cut the textile around the edge and folded the excess below the water line. Result - no more water loss. The next tip is to do with water. I made a big mistake by filling the pond from a hose attached to the domestic supply. We live in an agricultural area, and even the groundwater now is full of nitrites, which is ideal for promoting the growth of blanket weed. Fortunately with the purchase of a few plants some pond snails hitched a ride to our pond and set about demolishing the evil green slime. Even so it took a few months, and from then on we have kept the pond topped up with only rainwater captured in butts - a hose is run from the butts in wet weather. The pond has remained pretty much crystal clear. With sand mixed with a little soil (not too much) to form a natural bed, and oxygenating plants added, plus potted water lily (for shade in the water) reeds, sedges, arums, marsh marigolds and iris etc, we were set up and ready for the aquatic life to arrive. To get things going, in the spring we took a couple of bottles to a nearby natural pond and filled them with water to 'inoculate' our pond with water fleas and the like. The first to arrive were a pair of ducks, who set about eating all the plants. In the end we had to net the pond until they finally accepted that this was not to be their home! Thereafter, though, we have enjoyed a wonderful procession of wildlife. 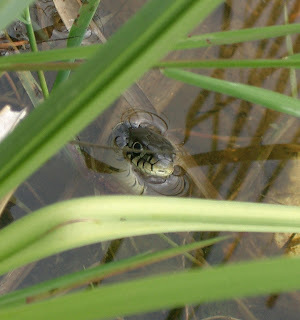 The first noticeable arrivals were diving beetles, soon followed by frogs, newts, dragonflies (and their mini lobster larvae) and then, tempted by the chance of the odd amphibian for lunch, a grass snake swimming in the water. The recent drought caused some anxiety as water levels fell perilously low, but it rained just in time. We have been delighted with the results. Birds drink, bathe and splash around and small mammals visit too.We are often asked if we have any fish. The answer is no, as fish would gobble up all the dragonfly larvae and other small creatures, and the diversity that we have would be much reduced. 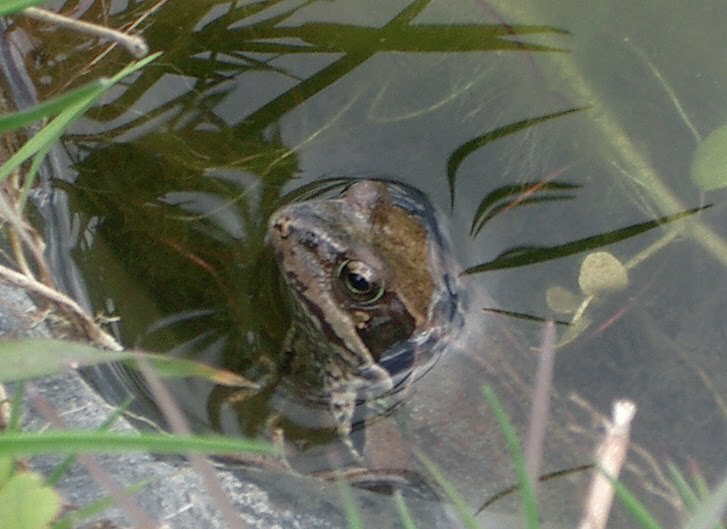 By the time full summer arrives, the water lily leaves will cover about a quarter of the surface, giving shade for the creatures that prefer it. Below is one of my favourite pond visitors - Hissing Sid, the grass snake likes to drop by from time to time in search of a tasty snack. Overall the wildlife area has been a great success, although it does take just a little more management than I had first imagined (I had imagined none at all) mainly cutting at the right time to encourage the widest variety of wild flowers, and keeping the rabbit population out. We also put up boxes with leaves and straw inside, or bundles of cut bamboo canes for mason bees and leafcutter wasps. These insect hotels are fully occupied. Once the structure is in place, it's not nearly a time consuming and arduous as 'regular gardening'. The rewards are great, and often unexpected, like the arrival of bee orchids, which are scattered thoughout the garden in June. It takes quite a bit of hard work to begin with, but afterwards the bore of mowing is restricted to just twice a year, and there's no need to visit the garden centre ever again! Just put a bench up, sip a cool beer and enjoy. If you hate conventional gardening, and have a neglected area, even if it's in the middle of town, it's well worth giving a wildlife garden and pond a go. Ecologically sound - and no more boring deadheading, mowing and mulching. Perfick! very nice indeed! I'm quite envious of that actually - i will have some land some day to dig a pond with an eyebrow! That's a "pond with an eyebrow", by the way. Not digging a pond, with an eyebrow. That would take too long. Where did you put all the mud that came out of it? The eyebrow looks much smaller than the pond hole! Hello Mr F. That 'eyebrow' is a boggy area, created by digging a shallow hole and lining it before filling in with compost & soil. There is an overflow from the pond into it. It's been a bit of a failure though as we get so little rain in this part of the world that the pond seldom overflows, so it will soon be reverted to meadow like the rest. As to the soil dug out, there was an old ditch under the hedge that we wanted to fill in, and the pond spoil just about did it. Hi, could you confirm details on the anchor trench as facing a similar challenge for securing the ljner and underlay in a natural looking pond ? The anchoring trench is a very simple device to a) prevent the membrane from being pulled out and b) to allow a "natural" edge to the pond. Once the main pond has been excavated simply dig a trench around it about 30cm from the edge. A spade's depth is about right. Reserve the excavated soil (if it remains in solid blocks, so much the better). Next carefully cut away the top 6cm - 8cm of turf between the pond edge and the trench. Reserve the turves. Line the pond with sand if there are sharp stones in the soil, then geotextile underlay. Then carefully place the membrane in the excavation making sure that both underlay and membrane have plenty of overlap. Fill with water. As it fills the membrane will take up its final position. Once just about full, fold the edge of the underlay and membrane into the anchoring trench and trim to fit. It should go across the bottom of the trench and 3/4 the way up the outer side. Replace the excavated soil and tread down firmly. The membrane is now secure. BUT you will have an exposed 25cm or so showing around the edge of the pond. Cover this with the turves that you set aside, and this will create a natural edge. Not sure if that is how a professional would do it, but it worked for me. If you decide to use protective textile OVER the membrane do be aware of the "wicking" issue that I describe in the post. It really had me baffled for a while!